If you’re a parent, it’s natural to want to make the best choices for your children. These days, it can be a little harder though, since you’re bombarded with information about everything from gluten-free diets to vaccinations. Sifting through all the information can be overwhelming to say the least. Refreshingly, when it comes to the oral health of your child, there’s little debate that dental sealants are a good thing. You may have already heard that they’re recommended, but what exactly are they and what are the benefits? If you’d like to know more, a pediatric dentist in Birmingham explains this simple, preventative and effective procedure. What Are Dental Sealants and How Will They Benefit Your Child? Sealants are a thin coating of resin that is painted on the chewing surfaces of the back teeth and then “cured,” or hardened with a special light. 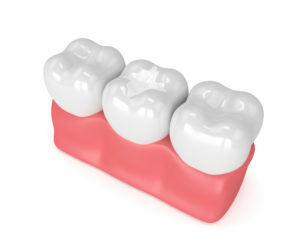 The material is similar to what’s used in a tooth-colored filling, also called a composite filling. If you could look up-close at the surface of a molar, you would see a lot of pits and grooves that toothbrush bristles can’t fit into to clean. Even if your child is doing a spectacular job with their brushing, cavity-causing bacteria are small enough that they find their way into these grooves and cause cavities. Sealants will coat these surfaces, creating a thin, smooth layer that protects the pits and grooves from bacteria and decay. First, the tooth is isolated with cotton rolls or a similar material so that it’s kept dry throughout the procedure. Next, a “special soap” is used to thoroughly clean the chewing surface of the tooth. This is left on for about 15-20 seconds before being rinsed away. The tooth is dried with air, and the sealant material is painted on in a thin layer. Finally, a curing light is applied to the tooth for another 15-20 seconds, which will harden the sealant and bond it to the tooth. Sealants are initially recommended around the age of six when the first adult molars come in. A second round is recommended about age 12, when the second set of molars appears. In addition, because sealants are subject to strong chewing forces and can wear away with time, they may need to be replaced anywhere from 4-8 years after being initially done. As for how beneficial they are, according to a CDC Vital Signs Report, sealants prevent 80% of cavities in school-age children. And children who don’t get sealants develop three times as many cavities! By spending a little time and money on prevention, not only do you save your children from going through more involved dental work, you save yourself a whole lot of money on dental bills. In fact, as a qualified pediatric dentist in Birmingham will tell you, the less a permanent tooth is touched, the better. If your children can enter adulthood with teeth that have never been filled, they’ll have a better chance of reaching old age and never needing much dental work. With new advances like sealants, what a difference from just a few generations ago, when it wasn’t uncommon to wear full dentures before the age of 50! Dr. Angelica Rohner is a pediatric dentist and mother of four who is passionate about providing outstanding, kid-centered dentistry to her community. With a background in teaching special education, she has set herself apart through receiving multiple dental awards as well as her extensive charity work. She can be contacted for questions through her website, or at (205) 870-0892.